A friend of mine recently came over to my house with a hearty vegan stew for lunch, and reminded me how nourishing and satisfying these simple whole foods can be. Ever since then, I have been dreaming of fresh, less processed food. The kind that fills your belly, but makes you feel light and happy for the rest of the day. 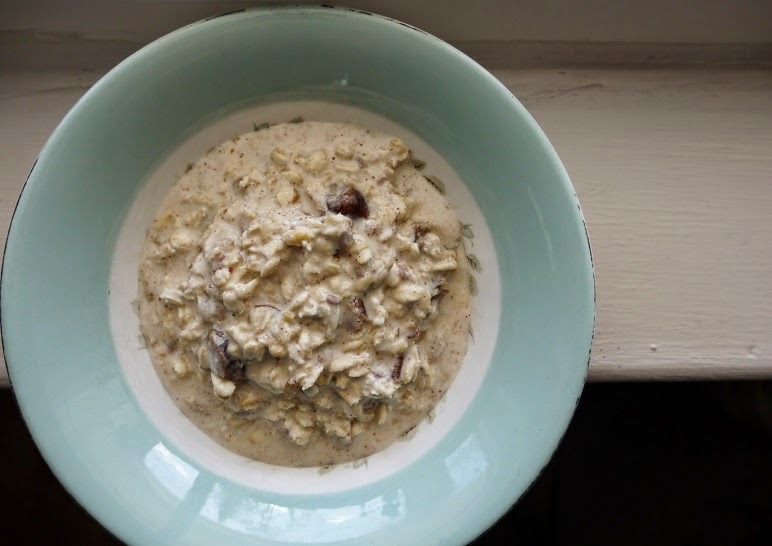 Bircher muesli is just that. A few choice ingredients, uncooked and cold soaked for a few hours, melding their flavours and textures together in a subtle way. It makes for a lovely breakfast meal, but I've been really enjoying it as a mid-afternoon or evening snack when I'm craving something sweet. Adapted from Super Natural Every Day by Heidi Swanson. Serves 1 (see note below). The original recipe suggests the amounts below would serve one, however I'm always wanting more after I've eaten a single portion, so I always double it. This is my personal favourite combination, but of course you are free to substitute the nuts, seeds, dairy, and fruit for any sort you like. Don't skip out on the dates, though: they melt into the liquid overnight, giving up a sweet soft texture that really makes this muesli shine. Place all ingredients, except the apple, into a bowl. Add 1/2 cup of water, and mix well. The consistency should be fairly runny. Place in the fridge for at least 2 hours, or better yet, overnight. Stir again, and enjoy with an extra drizzle of maple syrup if you're in the mood.